Golf Fitness Fundamentals: The goal of the golf swing is to strike the ball in order to achieve maximum distance with a high level of accuracy. 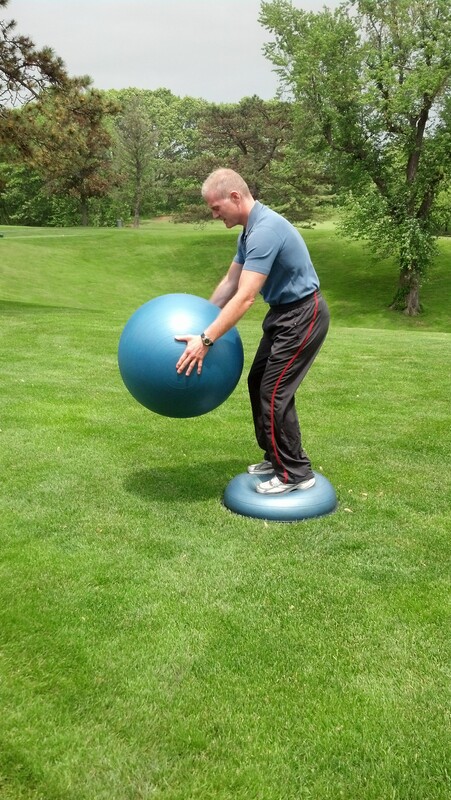 There is a kinesthetic sequence that will allow an efficient and effective golf swing. All great golf strikers have an identical sequence of generating speed and transferring energy through the kinetic chain. Each segment of the body builds upon the previous segment: lower body – torso – lead arm. The six phases of the golf swing are set up, backswing, transition, downswing, impact and follow through. The set up position is an athletic address of the ball. Proper balance and grip will lead to consistent swing. Improper set up will lead to re-routing of the club, poor sequencing, and swing faults, poor mobility and stability is common for a bad set up. Back swing is when you meet the club in the correct position during the back swing the body begins to recruit energy that will be transitioned at the top. Some joints will rotate while some joints will be stable. This will create torque and store energy in the muscle to be released at impact. Difficulty in the back swing are commonly caused by mobility and stability issues. Transition is when you begin the forward movement your weight shifts from the inside right foot to the inside of the left foot. The lower body moves first and the torso uncoils. This requires a high level of flexibility, balance and strength. In the downswing the weight shift continues generating torque and the power is transferred from lower body through the body then into the club. The torque is generated from the glutes, legs, and core created by the lower body. The downswing is complete when impact occurs with the golf ball. A golfer lacking physical strength, power or flexibility will struggle to develop the speed to transfer the stored energy during this phase. Impact is the part where energy created by the body is transferred into the golf ball. The purpose of impact is to hit the ball in the correct direction. During impact 80-90% of the left foot is supported by the golfer’s weight. The release of hands with correct timing will transfer the power to the club head. You must shift weight correctly to sequence the transfer of energy. Physical limitations such as poor mechanics and improper equipment effect impact. Lack of power will show up at impact to the ball flight and distance direction. Follow through is essential to the deceleration of the body after contact with the ball. This is completed through the body rotating when the club head is behind the golfer. This requires high levels of flexibility, balance, and strength within the kinetic chain.